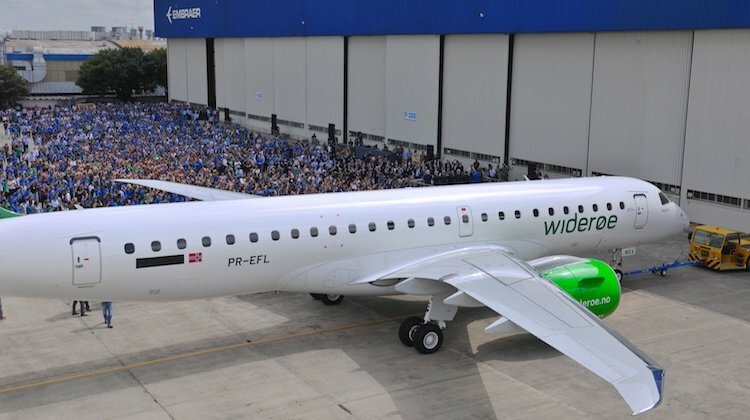 Embraer has officially delivered its first E190-E2 to launch customer Wideroe. The ceremony took place at Embraer’s São José dos Campo headquarters in Brazil on April 4 and was attended by hundreds of representatives from the manufacturer, the Norway-based airline, suppliers and invited guests. The aircraft, PR-EFL, was expected to be ferried to Norway shortly and begin revenue service later in April. VIDEO: The delivery ceremony of the E190-E2 on Embraer’s YouTube channel. The E190-E2, which is designed to seat between 97 and 114 passengers, is one of three variants in the E2 family of aircraft. Wideroe, which has three E190-E2s on firm order and purchase rights for a further 12 on the type, has configured the aircraft with 114 seats in a single-class layout. “The E190-E2 is an impressive aircraft. It is the ideal airplane for Widerøe as we introduce jets for the first time in the company’s 84-year history,” Widerøe chief executive Stein Nilsen said in a statement. “I am convinced our passengers are going to love the cabin, our operations people are going to embrace the new technology, while our financial collaborators will appreciate the economics the aircraft permits. Embraer Commercial Aviation president and chief executive John Slattery said it was a historic day and thanked Wideroe for being the launch operator of the E190-E2. The E190-E2 received its type certificate from the Brazilian Civil Aviation Agency (Agência Nacional de Aviação Civil – ANAC), the US Federal Aviation Administration (FAA) and European Aviation Safety Agency (EASA) in late February. Looking at the other two E2 variants, the E195-E2 (120- 144 passengers) began flight testing in March 2017 and is slated for certification and entry into service with launch customer Azul Brazilian Airlines in the first half of 2019. 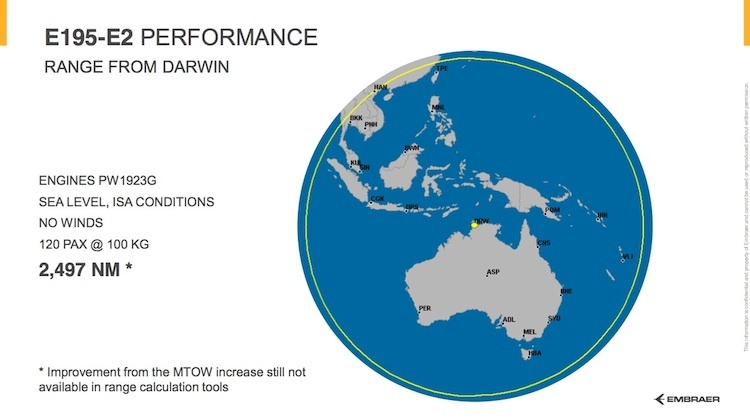 Boasting a range of 2,600nm, the E195-E2 is capable of operating Sydney-Bali or Darwin-Bangkok. Finally, entry into service of the E175-E2, which seats 80-90 passengers, was expected to occur in 2021. The trio will be powered by Pratt & Whitney PW1700G and PW1900G geared turbofan engines. The E2 improves on the current generation E-Jets with new engines, new aerodynamically advanced, high-aspect ratio, distinctively shaped wings, and improved systems and avionics, including fourth generation full fly-by-wire flight controls. This was expected to result in double-digit reductions in fuel and maintenance costs compared with the current E-jet family. From an environmental perspective, the new aircraft also produced less emissions and less noise. The aircraft will also have a new interior with larger overhead bins and a new first class concept, among other interior improvements. Indeed figures from Embraer showed the E190-E2’s fuel consumption was 17.3 per cent better than the current generation E190 during the flight testing program and a claimed “nearly 10 per cent better” than the aircraft’s direct competitor. Compared to the first-generation E190, 75 per cent of the aircraft systems are new. The E2 family of aircraft competes against Bombardier’s C Series jets and others in the up-to-150-seats segment that Embraer estimates will require 10,550 new aircraft over the next 20 years. Are changes to the Civil Aviation Act in the pipeline?